One March morning in 1920, a Czech teenager named Gustav Janouch arrived at the Workman’s Accident Insurance Institution, where his father worked. The purpose of the visit was for the seventeen-year-old aspiring poet to meet his father’s famous colleague, Metamorphosis author Franz Kafka (July 3, 1883–June 3, 1924), who had been laboring at the insurance company for twelve years. The two struck an unlikely friendship and for the remaining four years of Kafka’s life, they frequently shared long walks through the city, talking about literature and life. 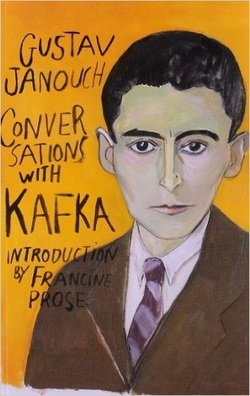 In 1951, long after Kafka’s death, Janouch published his recollection of these remarkably rich walking talks as Conversations with Kafka (public library). What makes these conversations so compelling is that much of what is said counters the familiar image of Kafka as a creature of grievance and gloom. Perhaps because we are constantly entraining each other through conversationand the young man’s openhearted optimism awakened dormant parts of Kafka’s spirit, there is radiance in a great deal of what they discuss — art (“Art like prayer is a hand outstretched in the darkness, seeking for some touch of grace which will transform it into a hand that bestows gifts.”), poetry (“Goethe says practically everything that matters to us human beings.”), and love. What is love? After all, it is quite simple. Love is everything which enhances, widens, and enriches our life. In its heights and in its depths. Love has as few problems as a motor-car. The only problems are the driver, the passengers, and the road. Far more often than we like to imagine, those problems can steer the car toward a crash. Kafka himself was intimately familiar with heartbreak, as evidenced by his beautiful and harrowing love letters. But perhaps because “heartbreak is how we mature,” his own experience is what allowed the author to offer young Gustav such strangely assuring advice in comforting the Gustav’s distress over his parents’ divorce — a rupture of the heart that had rendered him hopeless about the possibility of happiness in love. Just be quiet and patient. Let evil and unpleasantness pass quietly over you. Do not try to avoid them. On the contrary, observe them carefully. Let active understanding take the place of reflex irritation, and you will grow out of your trouble. Men can achieve greatness only by surmounting their own littleness. Patience is the master key to every situation. One must have sympathy for everything, surrender to everything, but at the same time remain patient and forbearing… There is no such thing as bending or breaking. It’s a question only of overcoming, which begins with overcoming oneself. That cannot be avoided. To abandon that path is always to break in pieces. One must patiently accept everything and let it grow within oneself. The barriers of the fear-ridden I can only be broken by love. One must, in the dead leaves that rustle around one, already see the young fresh green of spring, compose oneself in patience, and wait. Patience is the only true foundation on which to make one’s dreams come true. Conversations with Kafka is a trove of often dark, sometimes radiant, always profound insight from one of the most complex and compelling minds humanity has produced. Complement this particular portion with the great Zen teacher Thich Nhat Hahn on how to love and Milan Kundera on the central ambivalences of life and love.